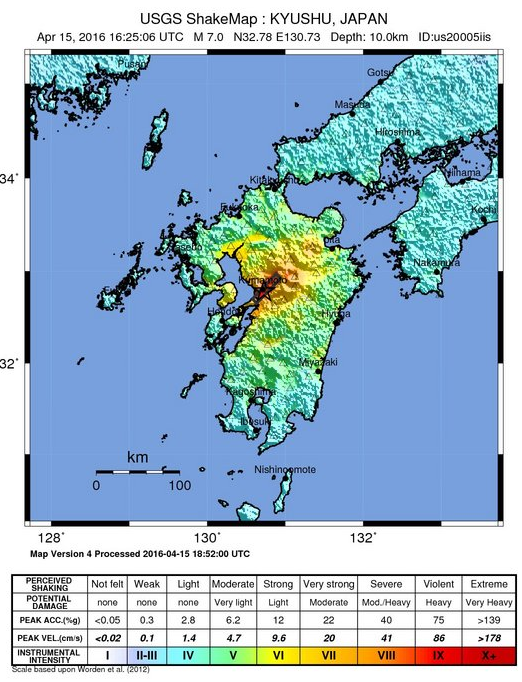 USGS shake map for the April 15 earthquake in Kyushu. TOKYO — Prime Minister Shinzo Abe held the ninth meeting of the Emergency Response Headquarters for the Earthquake Centered in the Kumamoto Region of Kumamoto Prefecture 2016 on April 18 at the Prime Minister’s Office. At the meeting, reports and discussions were held on the situation pertaining to damages and the response of each ministry and agency. “Units comprising approximately 30,000 members of the Self-Defense Forces (SDF), police, fire departments and medical units have been mobilized and are engaged in rescue and relief activities in the affected areas around the clock. There are still people who we have not yet been able to contact and there is also the possibility that there are people who remain trapped in collapsed buildings, so I want everyone to continue to exert all efforts for rescue and relief activities. “In order to assist the people affected who are being forced to live in an unsettled manner in evacuation centers and in the affected regions, by the end of today national public employees from the Team to Support the Daily Lives of Disaster Victims will be dispatched to Mashiki Town, Minamiaso Village and Uto City, where damage was most severe. I want everyone to work to ensure that measures are promptly implemented in response to frontline needs. “What is most important is to ensure that the necessary supplies, in particular sufficient food and water, are provided directly and without fail into the hands of the people affected. “With the cooperation of private sector transportation companies, local governments and the SDF are working together to make every effort in the provision of supplies. Across the affected region, there are still roads and bridges that are down, making transportation difficult. However, we will work resolutely to ensure that the people affected who are waiting for assistance on the ground will receive the supplies they need. “Above all, I want the Team to Support the Daily Lives of Disaster Victims to go into full operation, working at maximum strength and using all possible means to ensure that as well as necessities such as food, water and diapers, important daily essentials such as portable toilets and drugs are infallibly delivered to all of the people affected within today. “We will ensure that given concerns about long-term evacuation, an attentive response will be made to people with special needs, including the elderly and infants. We will work to accelerate restoration of lifelines like electricity, gas and water supplies, and the recovery of infrastructure, including roads and bridges, seeking to improve the living environment as much as possible. I want the government to create assistance measures to the greatest degree possible that will enable the people affected to rebuild their lives and return to normal daily living without delay, starting with the securing of accommodation facilities and housing for those who have lost their homes. “In parallel with dealing with the immediate challenges before us, we will take the initiative in advancing all kinds of response measures. The Team to Support the Daily Lives of Disaster Victims will swiftly be expanded to 100 people and I want the team to do everything it possibly can. “This afternoon, Osprey aircraft of the United States Armed Forces are working in cooperation with the SDF to transport relief supplies, including food and water, to Minamiaso Village. I have received a report that once the supplies arrive in the affected area, they will be distributed to the people affected. I would like to express my heartfelt appreciation for the friendship of the United States.